Oil on canvas, 41,5 x 32,5 cm. The painting portrays an attractive and expressive young man, probably Ortensio Crespi himself, who looks out at the viewer with a direct, insisting and even angry gaze. In his hand, he proudly displays a paint grinder as a sign of his profession. The portrait is painted with rough, lively and irregular strokes. There is visible overpainting around his beard and hair, which provides insight into the artist’s method of gradually working his way to the desired result. Particularly fascinating is the representation of the skin with strong green and blue tones in the shadows. 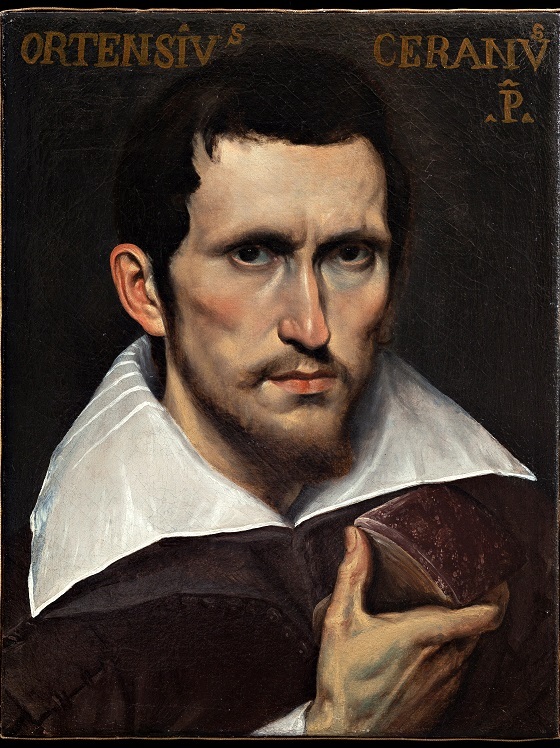 Ortensio was the brother of the more famous Giovanni Battista Crespi, known in art history as Il Cerano due to close professional connections to the town of Cerano. His father, Raffaele, was highly prolific as a painter in the area, and Ortensio was presumably trained in his workshop like his brother. At a young age, Ortensio moved with his two siblings to Milan, and together with his brother, he carried out numerous large commissions in the town’s churches, including the spectacular fresco cycle showing the miracles of St Charles in Milan’s cathedral in connection with the canonisation of St Charles in 1610.